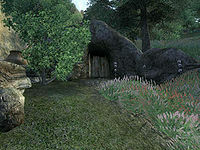 Exhausted Mine is a medium-sized mine between the Imperial City and Cheydinhal containing goblins (quest-related). It contains three zones: Exhausted Mine, Exhausted Mine Spent Works, and Exhausted Mine Bottom Section. You can enter this mine without starting the associated quest, in which case when you pick up the quest's Jade Amulet; your diary will recognize it and initiate the quest. This mine contains 7 Cairn Bolete plants and 17 Wisp Stalk plants. 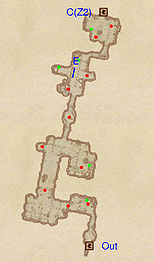 This location's map marker (M on map) is named Exhausted Mine (editor name ExhaustedMineMapMarker). The entrance door is NNE of the marker, 50 feet away. Exhausted Mine contains a large amount of goblin opposition, but the chests inside make it worth exploring. You will also need to fight your way through the three zones of this dungeon to retrieve a jade amulet for Corrick Northwode. Upon entering, proceed forward to find yourself in the first section of a large room. Stealth is advised when traveling though this area otherwise you will end up fighting multiple foes at once. This section contains a locked minor loot chest guarded by two foes. Continue onward through the next section of this room which consists of a passageway containing a silver vein guarded by one foe. You will now find yourself in the third section of this room which contains a silver vein and a chest guarded by two more foes. Continue forward through a narrow tunnel guarded by one foe to reach a chamber containing a silver vein, two chests, and two enemies; both chests contain minor loot but one is behind some loose planks at E. Proceed through a tunnel to reach the last room of this zone; defeat the two foes and loot the chest containing minor loot inside this area. Locate door C and enter it to reach the next zone, Exhausted Mine Spent Works. This zone is fairly linear like the first section, but the goblin opposition inside will make exploration difficult. Shortly after entering, you will find yourself in a room containing two chests guarded by one foe; one chest is behind some loose planks at E. Proceed through a short tunnel to reach the next room, which contains a silver vein and a chest guarded by two foes. After defeating the opposition and looting the potions from the chest, head through a tunnel to reach a small chamber containing a silver vein and a locked minor loot chest guarded by one opponent. At this point, you can head either west or south; head south to enter a tiny room with a chest containing potions guarded by a nearby foe. After looting the chest, head back to the intersection and proceed west to reach the upper level of a large room. It is advisable to use stealth and loot the chest near the entrance of the room rather than exploring the whole area. This is because the only loot in the lower section is two silver veins and they are guarded by three enemies. Regardless of your choice, once you have finished exploring this room locate door D and enter it to reach the next zone, Exhausted Mine Bottom Section. 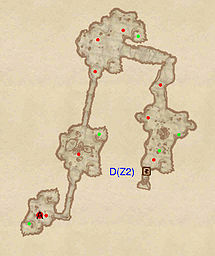 Like the previous two zones, this zone is very linear but also contains a fair share of goblins. Upon entering, you will find yourself in a fairly large room that contains a large fire in the center of the room, two enemies, and two chests. After obtaining the minor loot from these chests, continue forward through a tunnel guarded by one foe to reach a large room containing three enemies; don't forget to loot the chest in the northeast corner of this room. Proceed forward through a tunnel heading south to reach a room containing a large pile of skeletons and an opponent patrolling the area; defeat this enemy and loot the chest in the northeast part of the room. Continue onward through a short tunnel to reach the final chamber of this dungeon. Inside, you will find the Goblin Netherboss which carries the jade amulet that Corrick Northwode may have requested you to retrieve. You will also find one other foe in this room and a locked chest containing some minor loot. 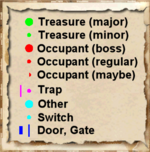 After you have defeated the opposition, obtained the necklace, and looted the chest, you will have to backtrack to the beginning of this zone and head through door D to head back into Exhausted Mine Spent Works.